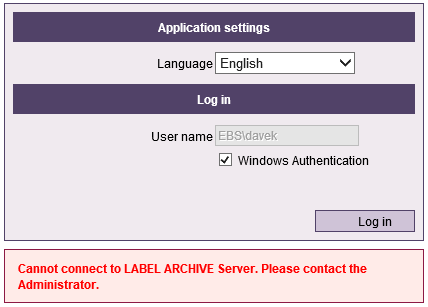 This Error Message Article explains the TEKLYNX CENTRAL error message “Cannot connect to LABEL ARCHIVE Server. Please contact the Administrator.” and details how to fix the underlying problem that caused it to appear. The Print User (browser) interface cannot connect to the LABEL ARCHIVE server. This situation occurs when the web server (IIS) is trying unsuccessfully to retrieve data from LABEL ARCHIVE server. Verify that all the label LABEL ARCHIVE services are running properly on the server.